According to the Credit reporting site WalletHub, Washington State’s economy ranked No. 1 in the nation, driven by strong gross domestic product growth, exports, and the percentage of high-tech jobs. Those high tech jobs include careers in STEM (Science, Technology, Engineering, and Math). Of course, that would mean that advanced science fields, such as materials science and additive manufacturing rank high, as well. Student education and workforce training programs contribute to that job growth and overall career opportunities. So, it comes as no surprise that Edmonds Community College enthusiastically supported the idea of creating a makerspace for students and the community. The makerspace is called The Facility and is housed in Monroe Hall, which is already a well-equipped materials science lab. The Facility is different than many college makerspaces, however, because it is a hybrid model that allows student use and also invites the community, residents who are not students, to come and use the space at low cost. 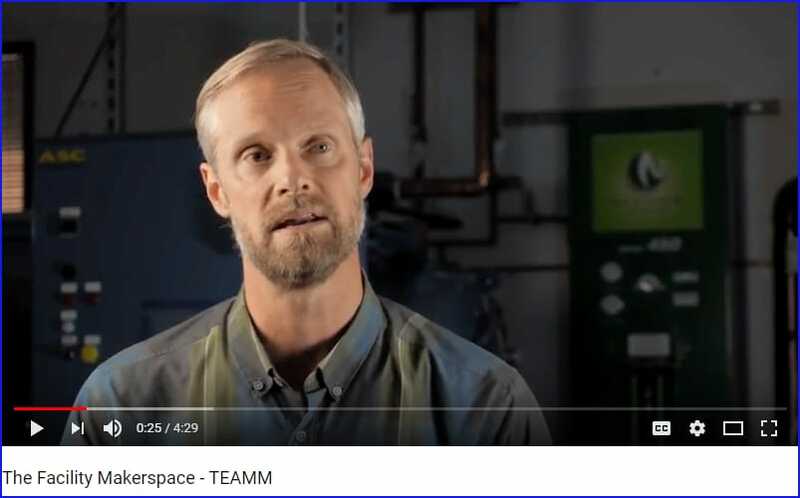 As you will hear in this short video, David Voetmann, Makerspace Program Manager of The Facility, explains how the process works for joining and participating in the space. Briefly, a makerspace is like a woodshop or metal shop or automotive class that many area residents would remember. A place, as Voetmann says, to share tools and innovation. Except instead of only power saws or welders or impact wrenches, you would have 3D printers, laser cutters, or 5-axis CNC machines – computer-controlled milling machines that cut on multiple angles. In addition, Monroe Hall is unique in that it is home to equipment that can make something out of carbon fiber (materials science) via vacuum bagging and an autoclave, not your usual makerspace gear. You can check out other TEAMM videos or look at the Materials Education channel on YouTube. Since two of the most popular machines in a makerspace are 3D printers and laser cutters (or laser engravers), it is logical that companies that provide those tools would have good resources. 3D printer manufacturer, Ultimaker, has a number of posts, books, and resources for school teachers, administrators, librarians (public and school), who might be interested to build a makerspace. One is called the Makerspace Bookshelf and the other helpful post is Fablab, makerspace, or hackerspace? –that highlights how to decide which one is right for your situation. LulzBot, one of the dominant 3D printer brands in education, has a case study on the Loveland CreatorSpace: Come for the Tools, Stay for the People. FormLabs, a resin-based 3D printer company, published Incentives and Ingredients for Building a Makerspacethat is instructive. If you have been contemplating a laser cutter, and a variety of other equipment, Epilog Laser, based in Colorado, offers a number of posts and a downloadable guide for lasers in education to help you determine what you need as well as steps to take to get your space up and running. This post (though it presents a slight bias given what they sell) Why Will a Laser be the Most Popular Tool in My Makerspace? presents four reasons why a laser will be a hit in your makerspace, hackerspace, or fab lab. Laura Fleming, an educator and media specialist, has written two excellent, best-selling books (also mentioned on the Ultimaker site). You can find both of them on her website: Worlds of Making. Both of them are about creating a makerspace in your school. They are also available on Amazon. She offers a steady stream of ideas and maker tips on her Twitter account – @LFlemingEDU. The study mentioned earlier in the post: WalletHub study: 2018’s Best & Worst State Economies. This article on the Edmonds Community College website gives additional details of how the school intends to use the makerspace: The Facility and the Rapid Proto Lab at Edmonds Community College. For more information visit The Facility website or email david.voetmann@edcc.edu.